In October 2013, Kuozui celebrated exporting the first batch of the new Toyota Altis sedans to the Middle East. 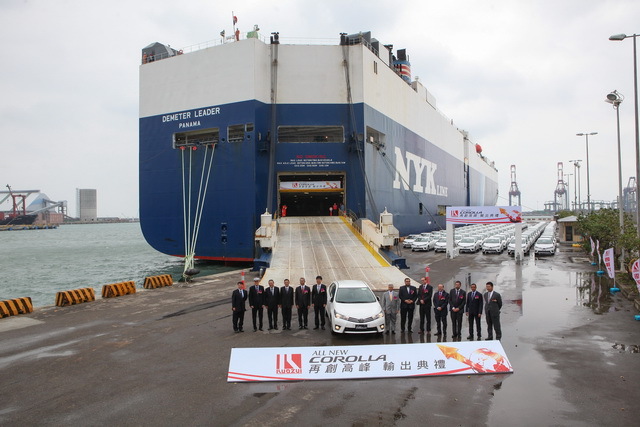 Kuozui Motors Ltd., an assembler of Toyotas and largest exporter of cars in Taiwan, hit a record export volume of more than 81,000 units in 2013, which is also the highest-ever in local automotive industry. Another local automaker, China Motor Corp. (CMC), assembler of Mitsubishi and own CMC brand vehicles, doubled its export volume of Taiwan-assembled Mitsubishi Lancer Fortis sedans to some 1,500 units, a new record in company history. Haruaki Hoshino, Kuozui's president, claimed that his company aims to achieve an annual production goal of some 200,000 Toyotas in 2014, including 100,000 Toyota Altis sedans for export, to celebrate the firm's 30th anniversary. Kuozui is a joint venture between Toyota Japan (70% shareholding) and Hotai Motor Co. (30%), the local agent of Toyota and Lexus. The firm said that in 2013 it exported more than 81,000 Toyotas to the Middle East through Toyota's sales channel, creating an estimated annual production value of more than NT$40 billion (US$1.33 billion) to the island's automotive industry, and generating about 12,000 jobs. The auto assembler stressed that in the fourth quarter of 2013, the new Altis was a hit in Taiwan's domestic market, while in the Middle East the new model also overwhelmed the regional market after its debut in December. Kuozui, as a result, is very optimistic about exporting about 100,000 Altis in 2014. The company began contract assembling Toyotas in Taiwan in 2009, and exported a total of 6,500 Taiwan-made Toyota Altis sedans (and some other models) to the Middle East in the year. In the future, Kuozui claimed, it will continue to strive to broaden its export model lineup from the island to upgrade economy of scale. Industry sources said that Kuozui's 2014 production volume goal of 200,000 units will be Taiwan's highest-ever record; and if things go smoothly, the company is also expected to be the first local automaker achieving 100% capacity utilization. In addition to shipping about 1,500 Mitsubishi Lancer Fortis sedans to the Middle East, CMC also exported 1,010 locally assembled Mitsubishi Zinger commercial vehicles and 751 CMC Veryca mini vans to other overseas market in 2013.